These are made from Rice Krispie Treats, or RKT as they are sometimes called. 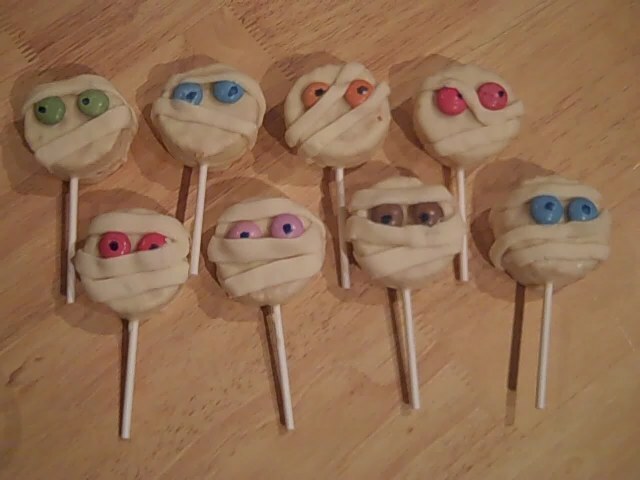 These Lollipop Mummies are easy to make, look fabulous and taste even better! Gently melt the butter in a large saucepan. Add the marshmallows and stir continuously until melted. Stir for another minute and remove from the heat. Pour in the Rice Krispies and mix in well. Allow to cool slightly, then turn out onto a large piece on greaseproof paper. Spread the RKT out as much as possible. Place another piece of greaseproof paper on top of the RKT and roll firmly – you are aiming for it to be around 1cm thick, yet compressed. Once cool, cut out 12 circles with a 5cm plain cutter. Melt the white chocolate in a basin over a pan of hot water. Working quickly spread chocolate on one side of half of the circles attaching a lollipop stick to each as you go, then spread chocolate on the other halves and sandwich them together with the lollipop sticks in between. Leave to cool in the fridge for 10 minutes. Re-melt the chocolate, if its too thick you can add a little vegetable oil to thin it out. Take your lollipops, one at a time, and dip into the melted chocolate and place on baking parchment. Add the smarties as eyes before the chocolate sets, you can draw pupils on the eyes using an edible pen. These are scary mummies remember – they don’t have to be perfectly smooth! Place back in the fridge to set. Using your white chocolate fondant, roll out and cut narrow strips. These don’t have to be exact – remember, they’re bandages! Wrap the bandages around the mummies, cutting off any excess. 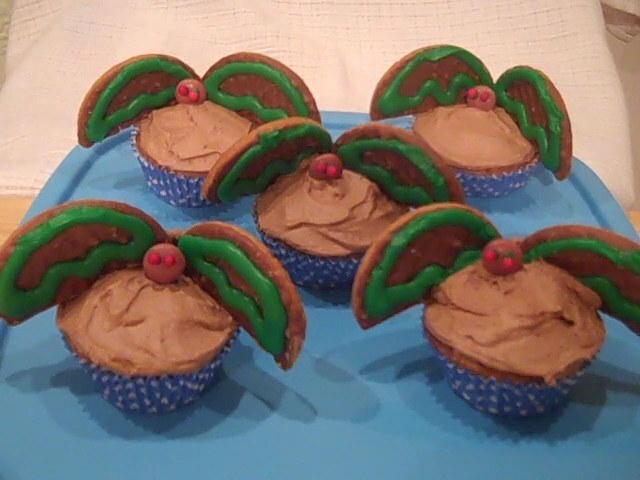 Will you go batty for these flying bat cupcakes? Creepy skeletons, but these won’t start rattling. Use your basic cupcake recipe to make your cakes. Cover the cupcake with chocolate frosting. Break a chocolate covered biscuit in half. Colour a small amount of icing green and pipe onto the biscuit to create wings. Place a brown smartie in the middle of the cupcake for the head. Make two dots for eyes using green icing or use small sugared sweets. Stick the decorated chocolate wafer halves on each side of the head for the bat’s wings. Push mini marshmallows into the frosting slightly for the head. Using black icing add the eyes and mouth. 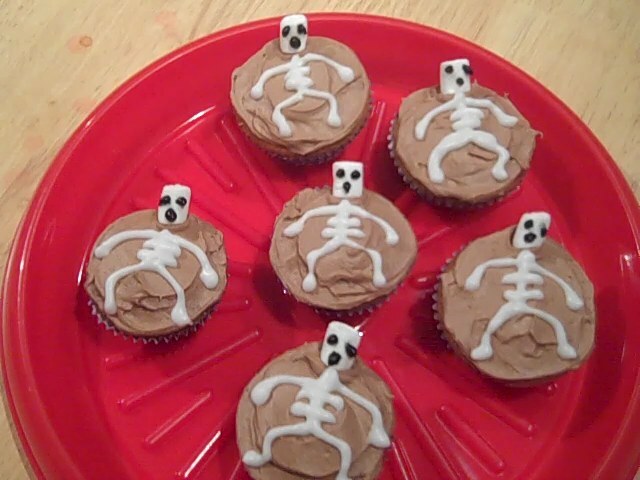 Use white icing to mark out the bones of the skeleton. Supernatural forces can’t chain these spooks to your Halloween table. Ingredients for basic cupcakes. This mixture will be enough to make 12 cupcakes (not muffin size) and 12 mini cupcakes, which you’ll need to make these ghosts. Method Pre heat the oven to 180C/gas mark4 and line a muffin tin with paper cases. In a mixing bowl, cream the butter and sugar until the mixture is pale and smooth. Add the eggs, one at a time, mixing for a few minutes after each addition. Combine the two flours in a separate bowl. Put the milk in a jug and add the vanilla extract to it. Add one-third of the flours to the creamed mixture and beat well. Pour in one-third of the milk and beat again. Repeat these steps until all the flour and milk have been added. Spoon the mixture into the cake cases, filling them to about two-thirds full. Bake for about 25 minutes, 15 minutes for the mini’s. Once removed from the oven leave in the tin for 5-10 minutes before transferring to a wire rack to cool completely. 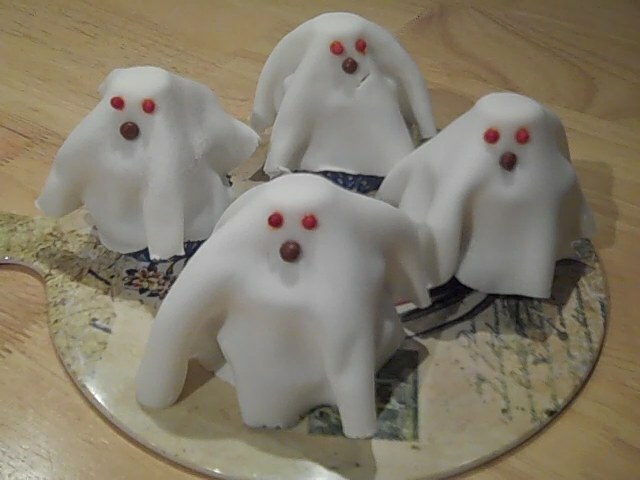 To construct the ghosts you will also need some buttercream, ready to roll fondant, 12 marshmallows and some sweets. Put a small amount of buttercream on top of each cupcake, not to cover it just in the middle of the cake. Take the paper cases off the mini cupcakes and place on top of the cupcakes that you have put buttercream on. Put a tiny amount of buttercream on the marshmallows, then stick the marshmallows to the top of the mini cupcake. So you have a small tower of cupcake, buttercream, mini cupcake, buttercream then marshmallow. Roll the fondant out very thinly, to about 6” – 7” circles, then place on top of your cupcake/marshmallow tower. 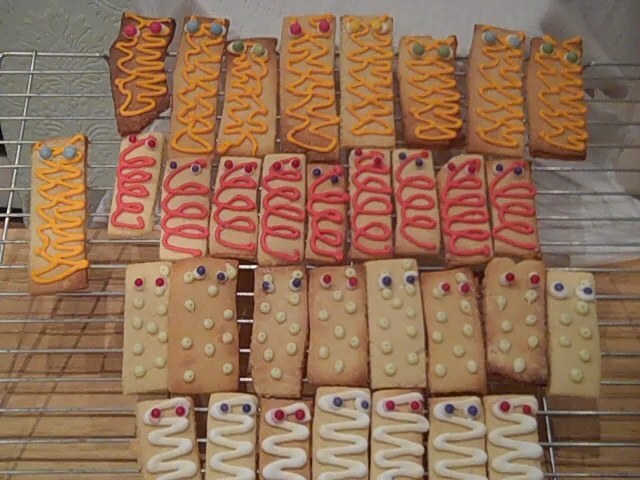 I then used writing icing to attach small sweets for eyes and mouth. If you have kiddies in the house, they’ll love to help with making these. Cream butter and sugar. Add egg and blend well. Add extracts and blend. Mix flour and salt and gradually add. Cover dough with cling film and chill dough for about 2 hours. Don’t skip this. You must chill the dough. Working with about 1/3 of the batch at a time, briefly knead the chilled dough and roll about 1/8 inch to 1/4 inch thick. Cut out shapes. Bake cookies on parchment paper-lined baking trays at 190C/gas mark 5 for 12-14 minutes. Thicker cookies may need up to 20 minutes. Just watch for edges that are nicely golden. Leave to cool on a wire rack. Beat the egg whites lightly and add the lemon juice. Add the icing sugar, a few tablespoons at a time, beating well after each addition. You want a nice thick consistency as you need to pipe it. Put an amount if the icing into four different bowls and add a different colour to each, mixing well. Decorate your sticks with whatever pattern’s you like, dots, squiggles, swirls, then add the eye’s. Put a small dot of icing where you want the eye’s then push on either Mini Smarties or coloured sugar balls. Makes 12 cupcakes, 6 of each. Preheat the oven to 180C/gas mark 4. Place paper cases into a 12 hole muffin tin. Beat the butter and sugar together until soft and light. Beat in the eggs a little at a time until well blended. Gently stir in the flour and baking powder until well mixed. Finally stir in the lemon juice. Spoon the mixture into the paper cases and bake for about 15 minutes until golden and springy to the touch. Remove from the tin and leave to cool on a wire rack. Sift the icing sugar into a bowl and stir in the lemon juice and hot water until thick enough to coat the back of a spoon. Spread the icing over 6 of the cupcakes and leave to set. Bring the cream to the boil in a small saucepan. Remove from the heat and add the chocolate. Leave for a few minutes for the chocolate to melt, then stir well until smooth. Allow to cool. Pour the chocolate mixture into a piping bag with a small tip (mine wasn’t really small enough) and pipe rings onto the white icing. 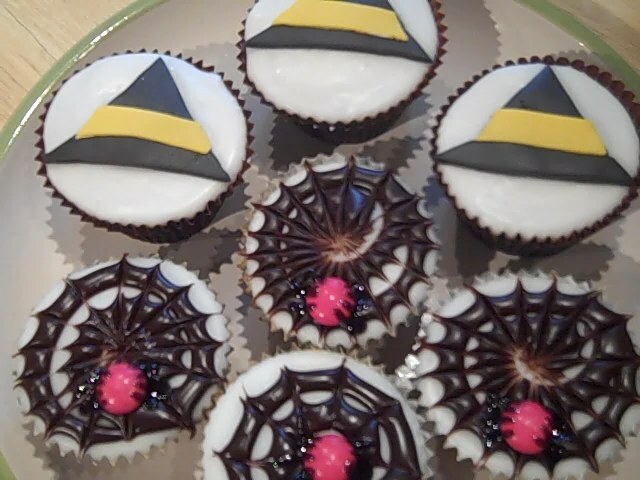 Using a cocktail stick, draw lines from the middle of the cup cake to the edges to create a web effect. 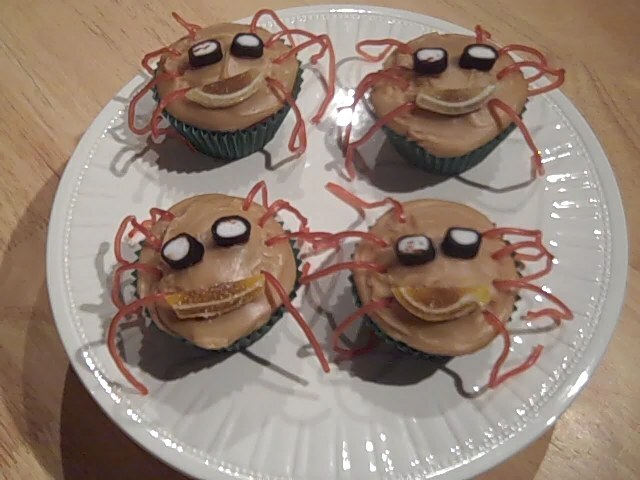 To make the spider, place a red smarties on the cupcake, then add the legs. Leave to set. Sift the icing sugar into a bowl and gradually beat in the vanilla extract and water until smooth and thick. Spread over 6 cupcakes. Roll out the black fondant. Cut into 6 hat shapes and stick on top of the cupcakes with a dab of water. Roll out the orange fondant to make the hat bands then stick on with a dab of water. Here are some fun cupcakes for a date coming up soon. Preheat the oven to 180C/gas mark 4. Place 12 paper cases into a muffin tin. Beat the butter and sugar together until soft. Gradually beat in the eggs. Stir in the treacle. Sift in the flour and ginger, then fold in. Stir in the ground almonds and milk, then stir until well blended. Spoon into the cake cases and bake for 20 minutes until springy to the touch. Leave to cool. For the buttercream, beat the butter until very soft. Sift in the icing sugar and beat until smooth. Divide the buttercream into two bowls. Colour one bowl green with the food colouring. To make the monster cakes, spread the green buttercream on top of 6 of the cakes.Decorate with two smarties for the eyes and 3-4 mini smarties for the mouth, add chocolate sprinkles for the hair. 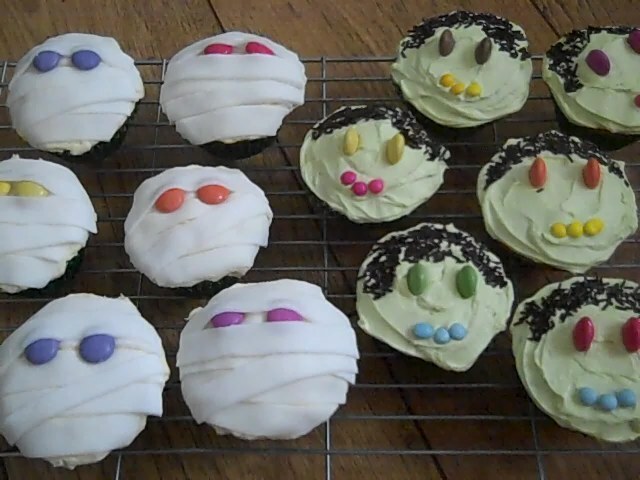 To make the mummies, spread the white buttercream over the remaining cakes. Roll out some white fondant thinly and cut into short strips. Lay the strips over the cupcakes like bandages, then add two smarties to each cupcake for the eyes.